Slot type may define a lot of features in slots gambling. Slot type may help the gamer to realize how to beat the slots or what particular slot strategy to choose. Thus, there are two kinds of slots that are subdivided into some more, depending on the slot type. Straight slot machine conduct pay outs according to the particular schedule listed on the slot machine itself. For instance, two apples can pay 5 coins, and 3 apples - ten coins. Hence, according to the scheme of payouts, such slots may be divided into the following 4 types. In multiplier, the number of played coins can multiple the payouts. For example, if slots pay 5 coins for 3 apples if the gamer pays 1 coin, then it should certainly pay out 10 for the next played coin, etc. There are no advantages of playing maximum coins. The principle of working is the same as with ordinary multiplier, however, the machine offers the bonus in the case of playing maximum coins. Thus, the winning can be doubled or even tripled. Learn about this kind of slots and much more to get a little bit bigger chance of winning. The line number the machine is sure to repay depends on the deposited coins amount. For example, 1 coin pays the middle line; if the winning combination is hit on the non-activated line, the gamer receives nothing. It is advisable to read the machine first. These machines are rather sophisticated, so it is better to consult the slot machine guide first. Such slots want the gamer to pay maximum in order to hit jackpot. Progressive slots are known to be the slots that have increasing jackpot with each played coin. If the jackpot is hit, the coin amount comes back to the starting point. Progressive slot machines can be of 2 types. Such kind of progressive slots is not linked to the other machines. Instead of particular fixed jackpot, standalone machine takes the percentage of the played coins and adds it to the reward for the top winning symbol combination. 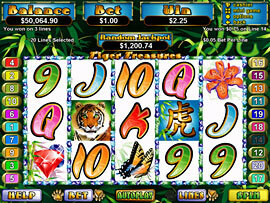 Traditionally, it has the slot meter that indicates the possible jackpot sum. Jackpot in standalone progressive is considered to be lower in comparison with the linked slot machines. These are known to be the slots that are linked together and offer the live exchange jackpots. They are more likely to be operated by the certain independent gaming company rather than some single owner.